"It is 1863, but not the one it should be. Time has veered wildly off course, and moves are being made that will lead to a devastating world war. Prime Minister Lord Palmerston believes that by possessing the three Eyes of Naga he'll be able to manipulate events and avoid the war. He already has two of the stones, but he needs Sir Richard Francis Burton to recover the third. For the king's agent, it's a chance to return to the Mountains of the Moon to make a second attempt at locating the source of the Nile. But a rival expedition led by John Hanning Speke stands in his way, threatening a confrontation that could ignite the very war that Palmerston is trying to avoid!" 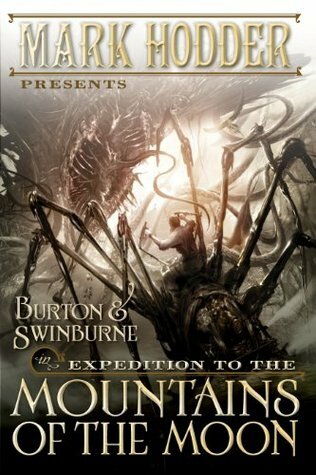 Expedition to the Mountains of the Moon is maybe the last Burton and Swinburne novel and while I talked at greater length about The Strange Affair of Spring Heeled Jack and about The Curious Case of the Clockwork Man, I will present here some thoughts about this book and the series in general. The two main characteristics of Expedition to the Mountains of the Moon are that in "the local" - chapter by chapter, adventure by adventure, scene by scene the book is just superb; great writing, Burton and the supporting characters excel, the pages are turning by themselves, the world building is detailed and believable, while the tech is pure steampunk fun. However in the "global", the book almost falls into the solipsistic - the action of one or more characters can erase/change timelines i.e. have God powers i.e. solipsism - trap that tends to afflict time travel changing the past novels. The "I do this, puff a whole history is erased and a new history that no one but me is aware of, comes into being" is ultimately a major destroyer of suspension of disbelief and while Expedition to the Mountains of the Moon stops at the "cliff" so to speak, the whole is less than the sum of its parts. The ending was superb though - balance of ambiguity and necessity - but while I would highly recommend the book and the series, it is not quite at a top 25 level for me. Looking back at the three novels as a whole, I would say that while Spring Heeled Jack was a little uneven until the author found his voice and the right narrative balance between steampunk and Dickensian stuff, with again an awesome ending to raise its level, The Clockwork Man was almost pitch perfect as it balanced the major aspects - the whys of the different history, the influences from the future, steampunk, social narrative - with great characters, addictive turn page writing and another excellent ending. Expedition offers arguably even better writing and more tension but by trying to tie things up and "explain" them, it also veers to close to solipsism as mentioned above. "Set in Calcutta in the 1930s, The Midnight Palace begins on a dark night when an English lieutenant fights to save newborn twins Ben and Sheere from an unthinkable threat. Despite monsoon-force rains and terrible danger lurking around every street corner, the young lieutenant manages to get them to safety, but not without losing his own life. . . .
Years later, on the eve of Ben and Sheere’s sixteenth birthday, the mysterious threat reenters their lives. This time, it may be impossible to escape. With the help of their brave friends, the twins will have to take a stand against the terror that watches them in the shadows of the night—and face the most frightening creature in the history of the City of Palaces." 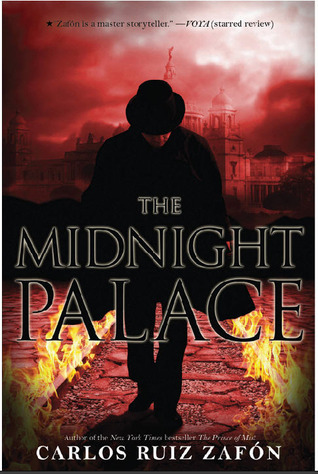 The Midnight Palace is the second offering in Carlos Ruiz Zafon's YA series that appeared in Spain in the early 90's before The Shadow of the Wind made him a household name in the literate world. After the mediocre The Prince of the Mist which was very YA so it passed its expiration date for me a long time ago, The Midnight Palace has all the elements that made his three adult novels to date so extraordinary: narrative energy, inventiveness, great characters (even as sketches here) and twists and turns that make you turn the pages till the end. In addition, the creepy descriptions that made the atmosphere of TSoW , The Angel's Game and The Prisoner of Heaven so awesome appear from the early pages and they are an integral part of why The Midnight Palace succeeds. Now the book is still YA, so we have relatively simplistic action and a generally predictable plot as the big picture goes, while the world building does not question the roles of our 16 year old heroes and heroines as main leads which is of course what tends to kill the suspension of disbelief for me as the world simply does not work like that - hence do not expect the layers and sophistication of the author's above mentioned adult novels. If you want an introduction to the author and see what the fuss about his superb novels is, this book will do since it's short and fast. Recommended with the caveat that is still a YA novel so with all the implied limitations thereof. Interesting take on the Burton and Swinburne books. I haven't gotten around to 'Expedition' yet, but it doesn't surprise me that Hodder's gone off the deep end. Clockwork Man was excessive enough. As a side note, you're using the word solipsism incorrectly here. It doesn't imply godhood or godlike powers. It's a psychological term for a worldview that doesn't acknowledged the existence of any other individuals. A solipsistic individual may believe him/herself to be a god, but there is no connotation of power attached to the term. You are right that "solipsism" does not imply god like power or anything like that but I would say that the book is solipsistic in its implications, not that the characters like Burton are. In other words the book presumes a world whose "objective" existence depends on the actions/thoughts of one person and this is ultimately (imho) the essence of solipsism, that "nothing else but oneself is objectively out there".